Birding Is Fun! : Lucky to Live in an Idaho Birding Hotspot - Avimor! Lucky to Live in an Idaho Birding Hotspot - Avimor! 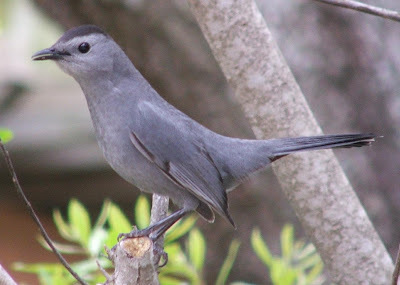 Robert had a new and totally unexpected "life bird" this morning along Spring Valley Creek, a Gray Catbird. This makes "life bird" #299 for him. When, where, and which lucky bird will make #300? 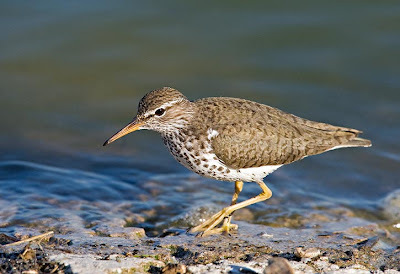 Another cool Avimor first was a Spotted Sandpiper spotted on on the rocky shore of Avimor Town Lake. 56 species of birds were seen at Avimor in May 2009. That's pretty darn good for our foothills location. A pretty great month for birding at Avimor considering that 58 species have been seen here year to date. The Parks boys discovered a Mourning Dove nest on the ground on the side of the hill very near the homes. Robert had seen Mourning Dove nests on wide horizontal branches before, but never on the ground. The All About Birds website says that it is common for them to nest on the ground in the west. Below is photo by Robert on Sunday, May 31st. An Avimor customer whose home will start soon observed the Swainson's Hawks mating the other day. Robert observed them mating again this morning. The nest is very near the Avimor Entry Tower, so it will be fun to watch more chicks being raised. Photo below by Robert. There are now no Great Horned Owl chicks in the nest. I don't see them in nearby trees, but hopefully they are alive and well and just concealed by the dense foliage. Avimor resident Marc Grubert informs me that he came across a pair of Long-billed Curlew while mountain biking in some of Avimor's back country. Very cool!